Predictive maintenance is a common value proposition cited for IoT analytics. In this tutorial will look at a value formula for net savings. Then we walk through an example as a way to highlight how to think financially about when it makes sense to implement a decision and when it does not. The economics of predictive maintenance may not be entirely obvious. Believe it or not, it does not always make sense, even if you can predict early failures accurately. In many cases, you will actually lose money by doing it. Even when it can save you money, there is an optimal point for when it should be used. The optimal point depends on the costs and the accuracy of the predictive model. This article is an excerpt from a book written by Andrew Minteer titled Analytics for the Internet of Things (IoT). 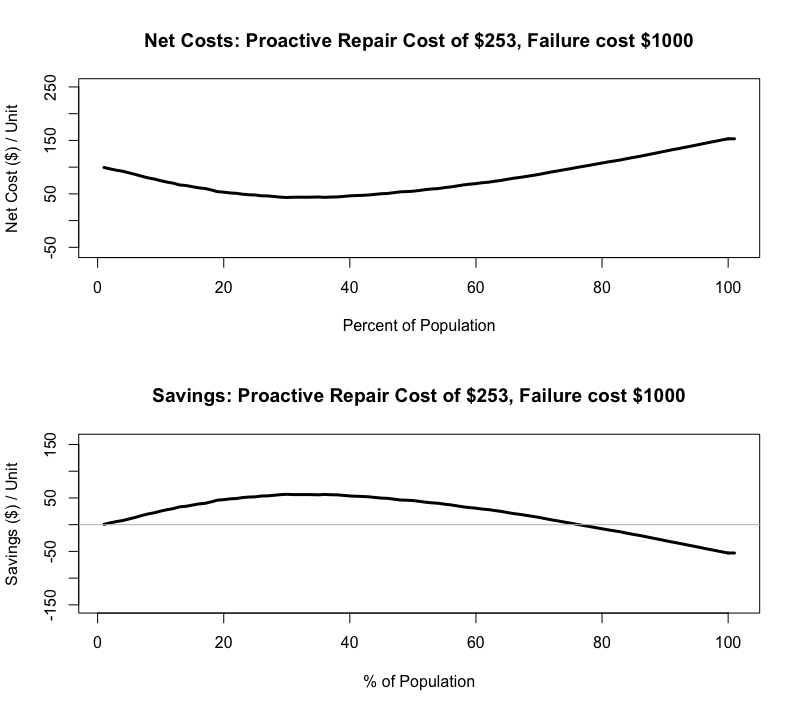 If the cost of failure is the same as the proactive repair cost, even with a perfect prediction model, then there will be no savings. Make sure to include intangible costs into the cost of failure. Some examples of intangible costs include legal expenses, loss of brand equity, and even the customer’s expenses. 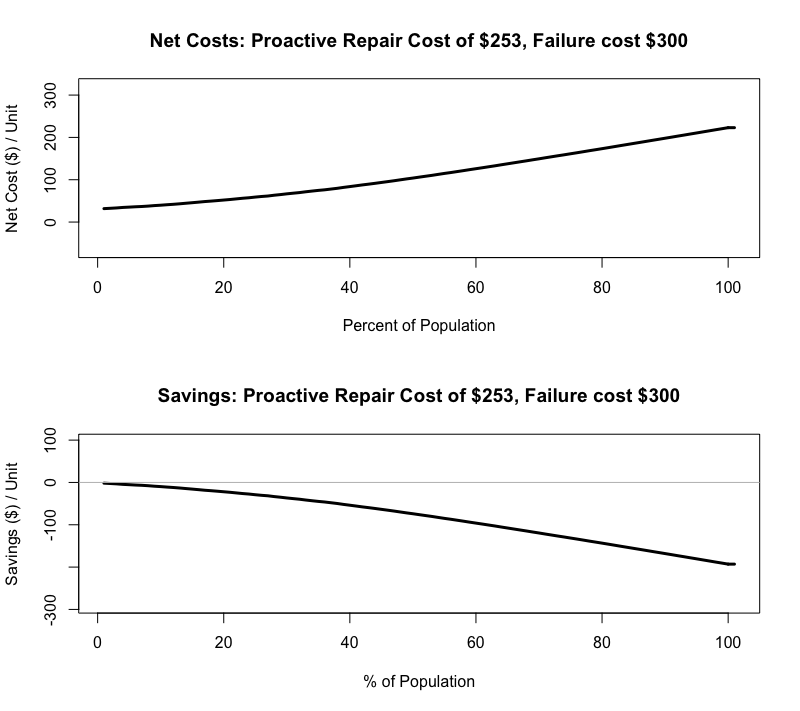 Predictive repair does make sense when there is a large spread between the cost of failure and the cost of proactive replacement, combined with a well-performing prediction model. For example, if the cost of a failure is a locomotive engine replacement at $1 million USD and the cost of a proactive repair is $200 USD, then the accuracy of the model does not even have to be all that great before a proactive replacement program makes financial sense. On the other hand, if the failure is a $400 USD automotive turbocharger replacement, and the proactive repair cost is $350 USD for a turbocharger actuator subcomponent replacement, the predictive model would need to be highly accurate for that to make financial sense. To illustrate the example, we will walk through a business situation and then some R code that simulates a cost-benefit curve for that decision. The code will use a fitted predictive model to calculate the net savings (or lack thereof) to generate a cost curve. The cost curve can then be used in a business decision on what proportion of units with predicted failures should have a proactive replacement. Imagine you work for a company that builds diesel-powered generators. There is a coolant control valve that normally lasts for 4,000 hours of operation until there is a planned replacement. From the analysis, your company has realized that the generators built two years prior are experiencing an earlier than the expected failure of the valve. When the valve fails, the engine overheats and several other components are damaged. The cost of failure, including labor rates for repair personnel and the cost to the customer for downtime, is an average of $1,000 USD. The cost of a proactive replacement of the valve is $253 USD. Should you replace all coolant valves in the population? It depends on how high a failure rate is expected. In this case, about 10% of the current non-failed units are expected to fail before the scheduled replacement. Also, importantly, it matters how well you can predict the failures. Ultimately, the decision is a business case based on the expected costs and benefits. ML modeling can help optimize savings under the right conditions. 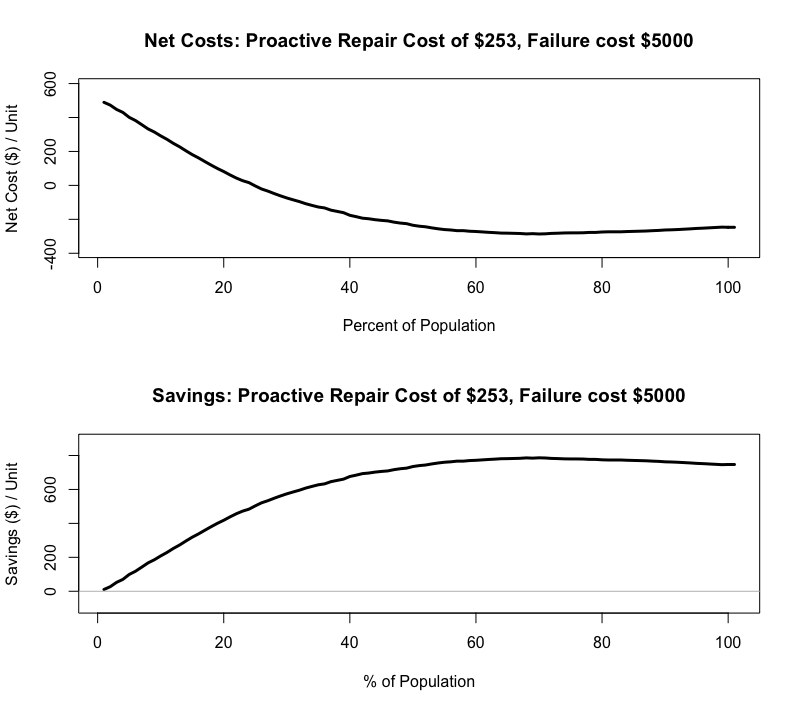 Utilizing cost curves helps to determine the expected costs and savings of proactive replacements. In this tutorial, we looked at implementing economically cost effective IoT analytics for predictive maintenance with example. To further explore IoT Analytics and cloud check out the book Analytics for the Internet of Things (IoT).